After announcing its mobile software development kit (SDK) earlier this month, Twitch today revealed one of the first smartphone and tablet games that will be taking advantage of it. Asphalt 8: Airborne, the arcade racing title developed by Gameloft, will be the first game to support built-in Twitch streaming. Without any additional hardware or software, players will be able to stream gameplay live to their Twitch channel, alongside audio and video sourced from their iPhone, iPad or iPod touch. The latter means players can easily narrate what’s happening on stream, explain complex techniques and quickly respond to viewer questions. 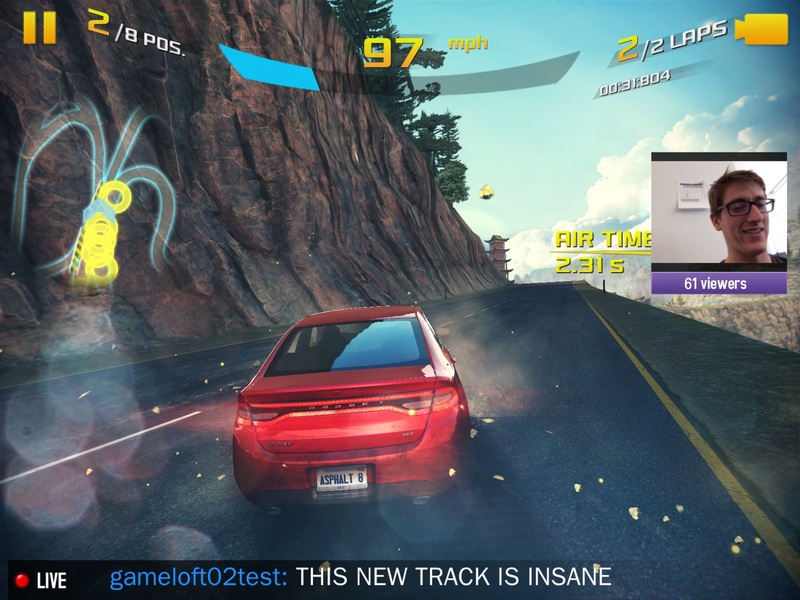 In addition, broadcasters will be able to monitor the chat area while they’re playing, archive their streams for on-demand playback and also review other Asphalt 8: Airborne livestreams without leaving the iOS app. Smartphone and tablet gaming continues to grow, so it’s not surprising that Twitch wants to target the popular platform. While its official mobile apps have surpassed 10 million installs combined, the number of streams for mobile games – particularly without the use of emulators – has been low in comparison to PC and home console titles. Broadcasting from a desktop or laptop has always been fairly straightforward and the recent Twitch integration for the PlayStation 4 and Xbox One has made it equally simple for console games. Provided developers adopt Twitch’s new mobile SDK, the video game streaming platform could receive a similar, if not higher boost from smartphone and tablet users. TwitchPlaysPokemon, a social experiment that allows millions of people to control the same single player game by submitting commands in the chat window, is a perfect example of the platform’s untapped potential. While it’s not available on iOS or Android, it proves that a game doesn’t need to be technically sophisticated to attract a large viewership on Twitch. A release date for the updated Asphalt 8: Airborne app hasn’t been given, but Twitch is confident the streaming features will be patched in later this month. To coincide with the announcement, Gameloft will be hosting a 24-hour livestream event here on their Twitch channel.